Saturdays London Sketchcrawl was a blast! 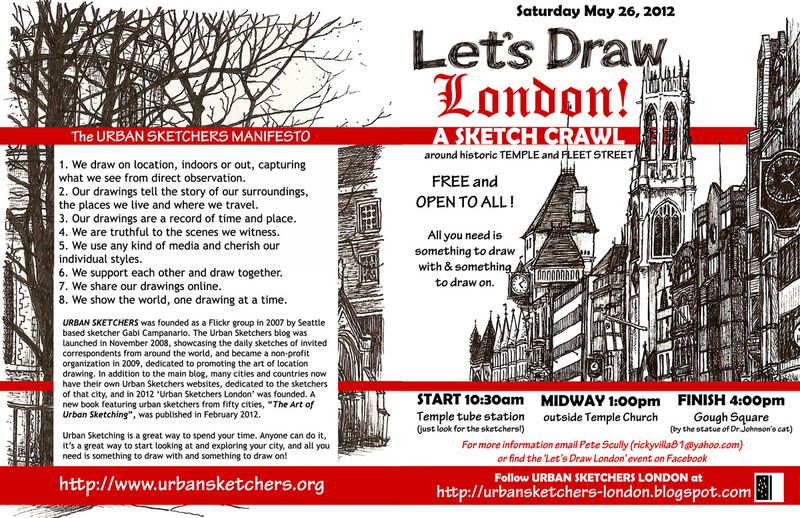 I have never seen so many people all gathered together with one mission-and that is to SKETCH LONDON! 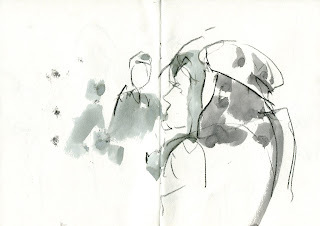 It was a sunny day and simply an amazing day to unleash the sketch motions within us! I decided to concentrate on statues because, just walking from Temple Station revealed so many statues. 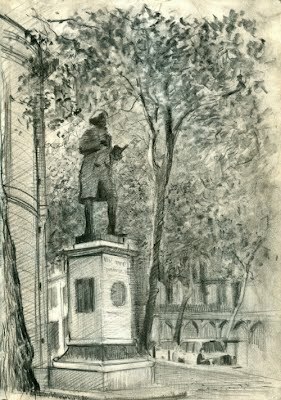 At first site I fell in love with the Statue of Gladstone, so I decided to get that one done first. Then I walked further down and I noticed The Samuel Johnson Statue. 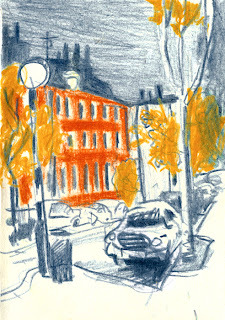 This was my final Sketch of the day. For both sketches I sat on sand bags available as I didn't have a folding chair or anything decent to sit on. I have used an A4 Moleskine Sketchbook and used a variety of pencils ranging from: Chunky Graphites, Mechanical Clutch pencils, Oil base Pencils, Rexel Carpenters pencils and graphite pencils to the wonderful Mars Lumograph pencils by Staedtler. I have left the pictures here below which tell more of the story than words can explain. 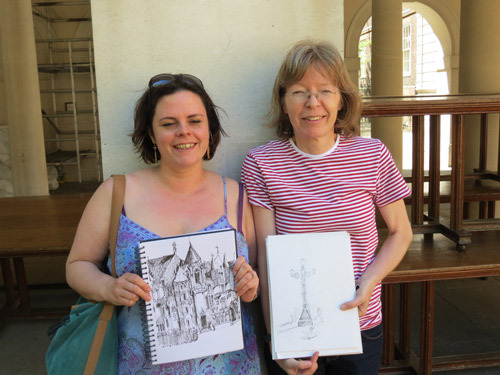 Today we've got photographs taken during the course of yesterday's "Let's Draw London" Sketchcrawl of Fleet Street and Temple. 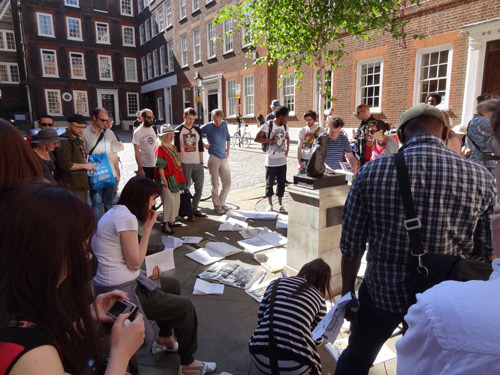 Around about 40 people assembled at Temple Station at 10:30am - although we think around about 50 participated during the course of the day. 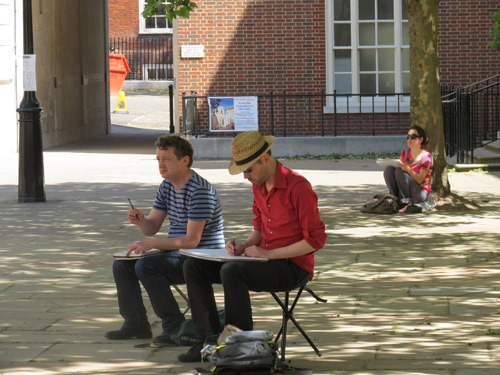 Urban Sketchers London joined forces with the Draw London on Location group which sketch London on a regular basis. We'll be looking at swopping details about events in the future. 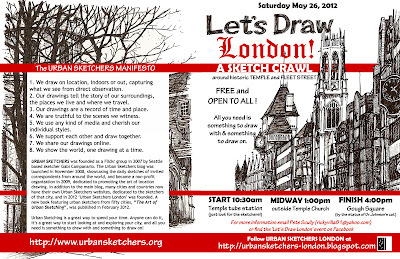 If you'd like to know more about Urban Sketchers events we suggest you subscribe to this blog. 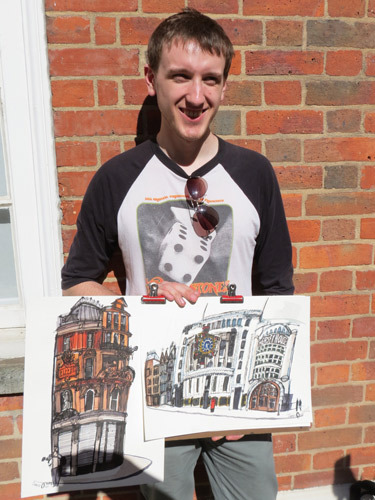 Pete Scully organised the sketchcrawl and had leaflets for everybody which included maps of the area, places to sketch and watering holes. How long is a bridge in pencils? 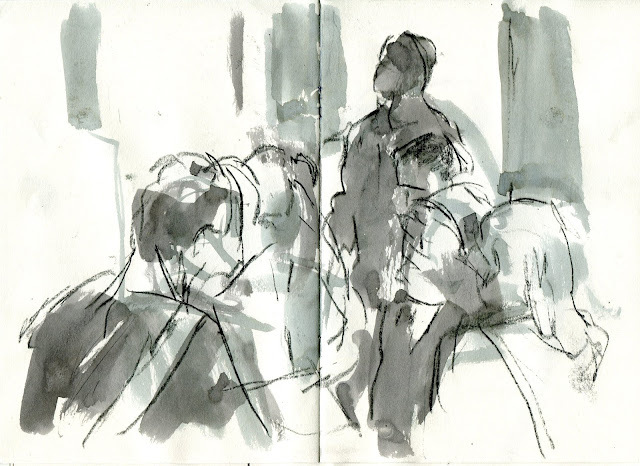 Sketching with comforts - shade on a blistering hot day, cup of tea, flat surface, good view! 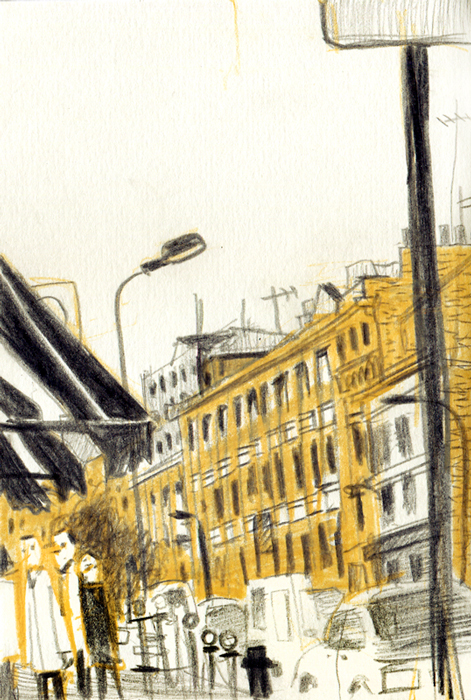 A seriously big watercolour sketch! 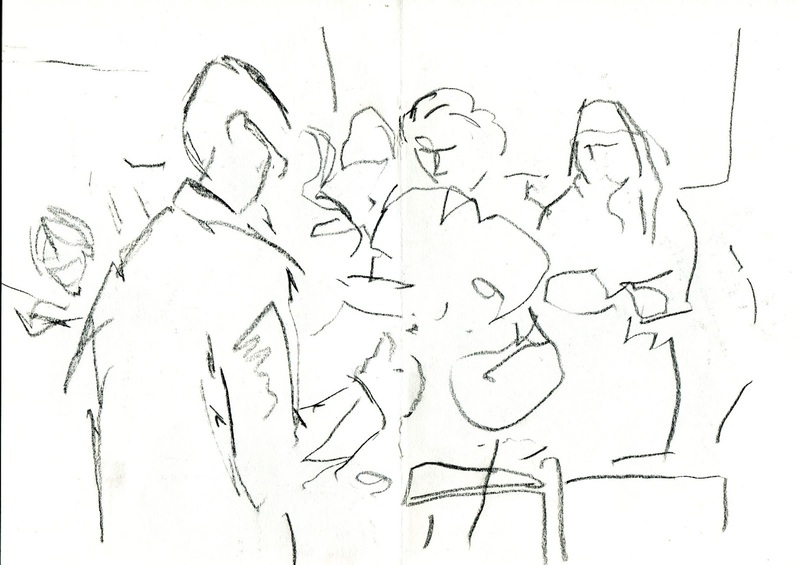 We met up at lunchtime at the Temple Church. This is despite the fact that quite a few of us wandered around Temple trying to find a way in! (It's private property and most of the doors are locked at weekends). It's amazing just how many people did turn up! At the end of the day there were still a lot of people around - and a lot of sketchbooks. Correspondents will be posting their sketches to this blog over the course of the next week. 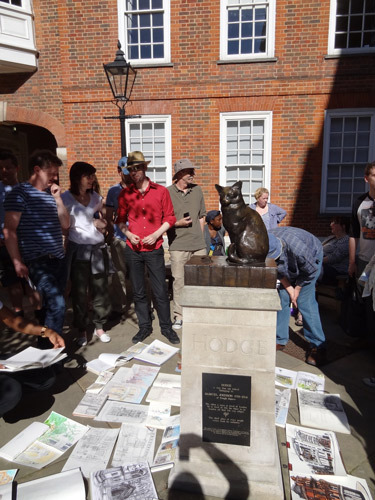 If you joined the sketchcrawl yesterday and would like to display your sketches, you can now post then to our new Flickr Group - Urban Sketchers London - Group Pool. If you'd like to join and want an invite please let us know. You'll need a Flickr account to be able to post images to the pool. email us and we'll send you one. 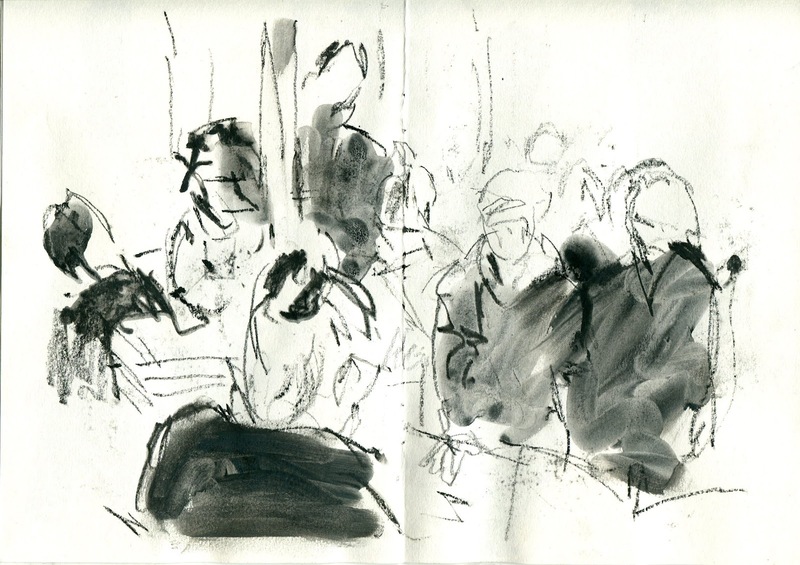 While my Urbansketcher-London friends were showing their work and talking with customers at the launch of the Art of Urban Sketching at Cass Art, I managed to scribble a few sketches of the crowd. 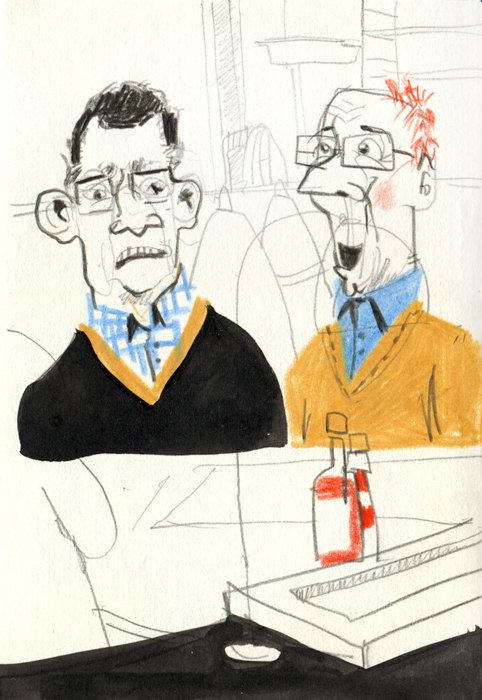 I thought this visitor had a very fetching beret. Here's the map for the Let's Draw London Sketchcrawl TODAY! Pete Scully has returned from his home in California - although he's in Paris for a couple of days this week. 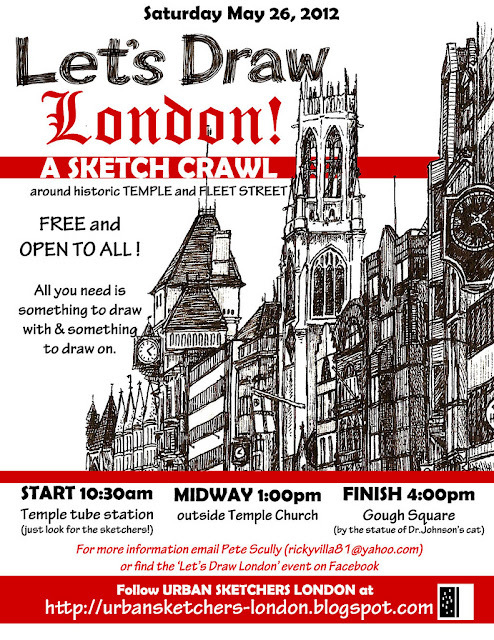 Hence why I'm posting this reminder about the "Let's Draw London" Sketchcrawl which he is leading is on Saturday 26th May - around the Historic Temple and Fleet Street area. Come and join us for a sketch crawl around the historic Temple and Fleet Street area of London! 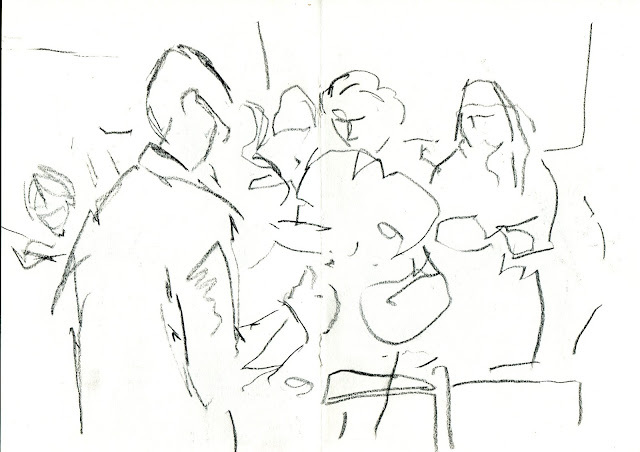 We will spend the day exploring and sketching, in groups or individually (as you prefer), before meeting up at the end to look at each others' sketchbooks. 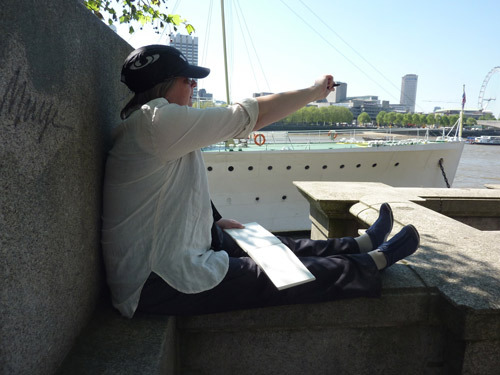 I went with my sketching group, The Bankside Group to visit Greenwich and all round the Royal Hospital and along the river to the Trafalgar Tavern. 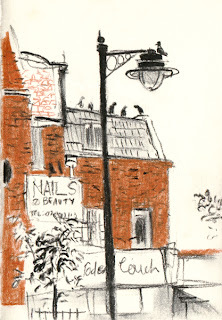 This hostelry is well worth a visit with lots of history and a great view of the Thames from their bay window. 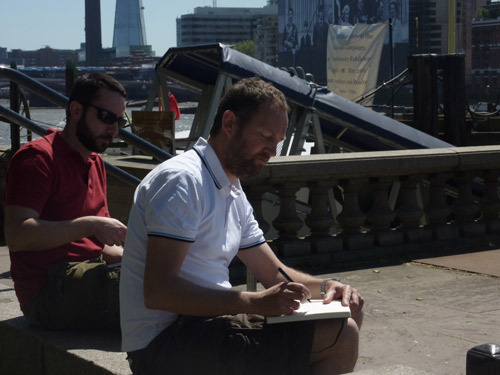 Highlight for me was painting on the river bed ( fortunately it was low tide), it gives a completely different perspective for drawing and in the distance you can just see the newly renovated Cutty Sark. 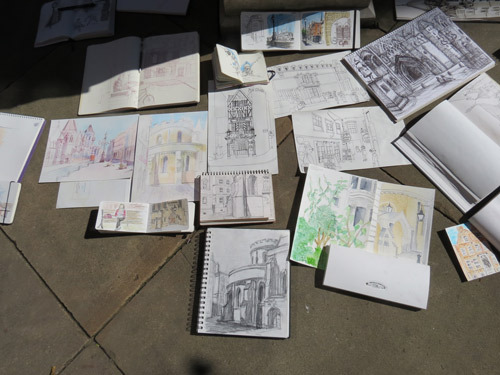 Greenwich really is a great place for a sketcher to visit lots to do, great pubs, a lively market place, the Royal Observatory and of course the River Thames. 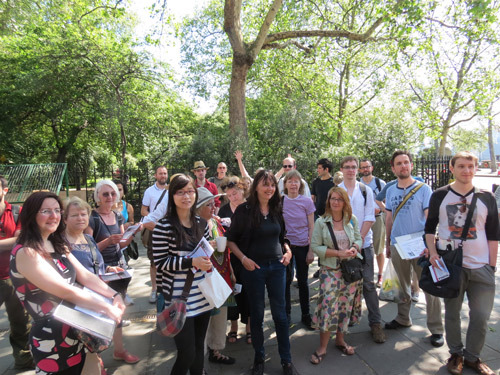 The Bankside Group meets monthly and try to go to some interesting places all around London. 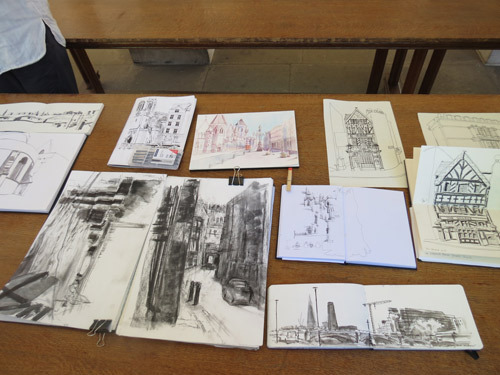 London Urban Sketchers showed their sketchbooks and talked about their favourite materials and methods at Cass Art, Islington on Saturday 19 May. They were busy all afternoon, and the book got an excellent response from shoppers! 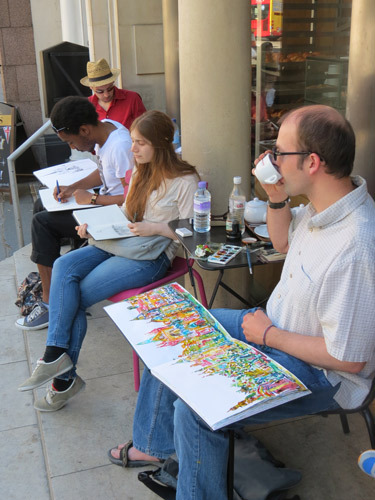 The Art of Urban Sketching, by Urban Sketchers founder Gabriel Campanario, has its London launch on Saturday 19th May at Cass Art's flagship art materials store in Islington N1. 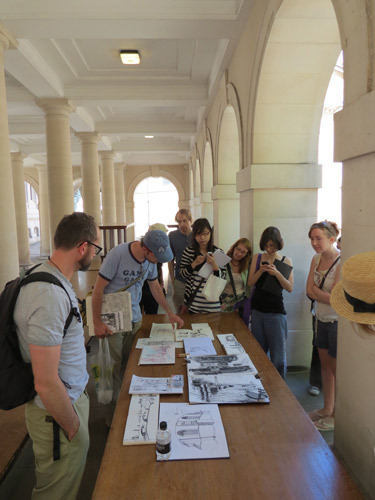 Six of the London-based Urban Sketchers with work in the book – Adebanji Alade, James Hobbs, Barry Jackson, Olha Pryymak, Katherine Tyrrell and Zhenia Vasiliev – will be present on Saturday 19 May between 12.30pm and 5.30pm, with some of their sketchbooks and drawing materials, and ready to answer questions. 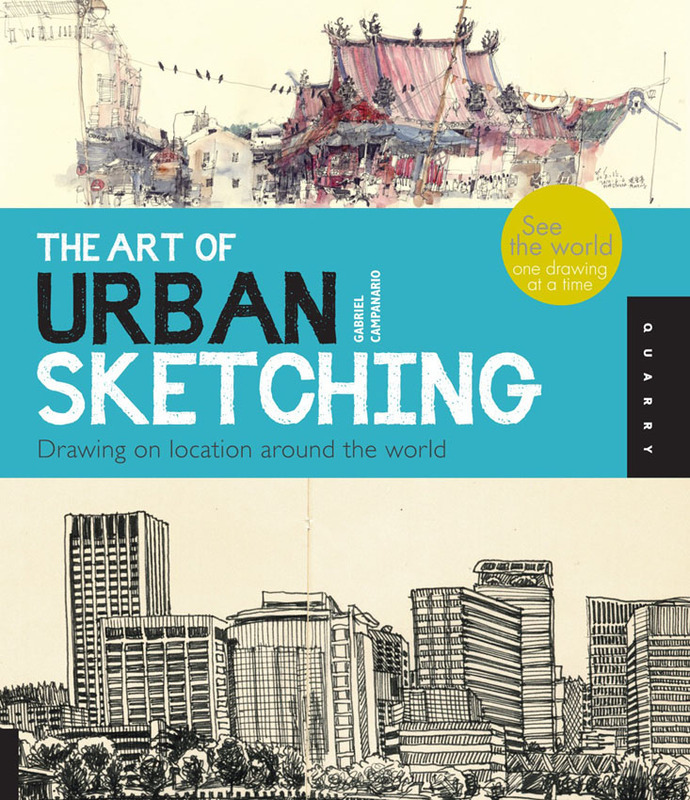 Get the incredible new book 'The Art of Urban Sketching' for only £12.95 at our launch event in Islington tomorrow! Usually £17.99 this offer is valid for tomorrow only. 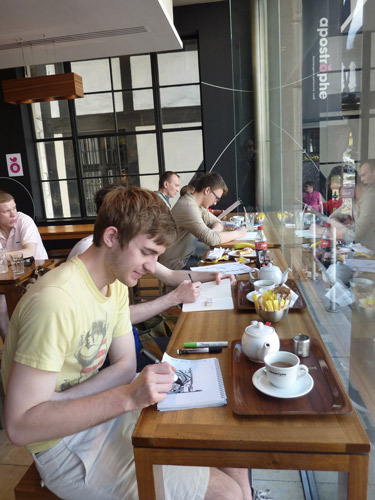 Drop in to meet the artists featured in the book and get tips and advice on drawing on the go. 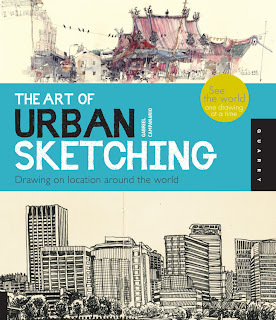 Don't know much about Urban Sketching? Look here. 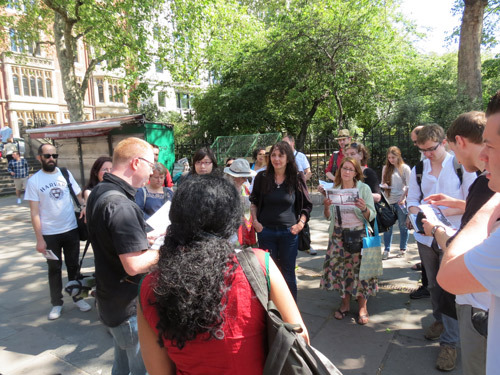 Wondering how to get to Cass Art? 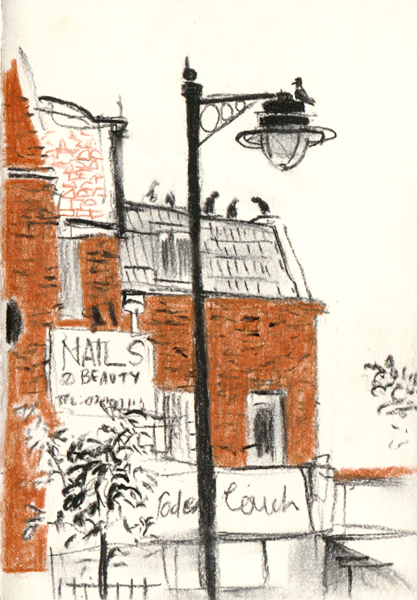 Here's a link to Cass Art Islington, 66-67 Colebrooke Row, London N1 8AB Click the link for a map of where this flagship art store is located. Buses: Put "Colebrooke Row Borough of Islington, N1" into the TfL bus maps and it will identify all the buses that run near to Cass Arts. The click the number of the bus to see the route and the bus stops. the Transport for London map of the Planned weekend Tube closures for the weekend 19/20 May 2012. This is the link to the Transport for London pdf file which shows the service disruptions this weekend. 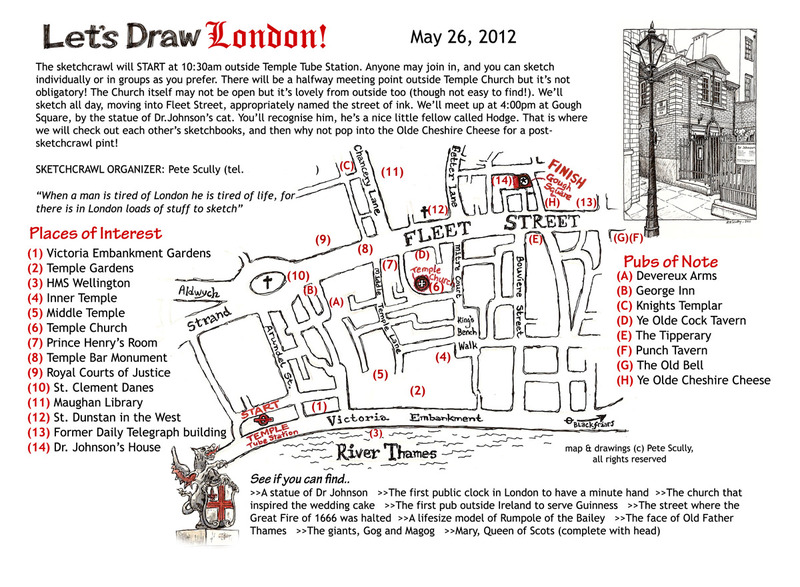 Use the Journey Planner on the TfL website to work out the best route to the store on Saturday afternoon. 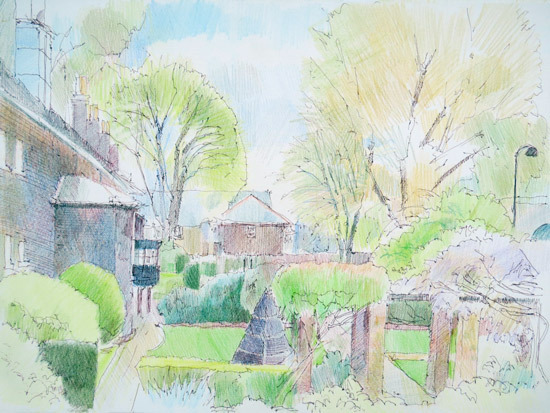 The Geffreye Museum is a museum of the home and garden between 1600 and the present day in Hoxton. There are a set of period gardens to match the period rooms. What I like best about Spring is the very fresh crisp vibrant leaf colours on the trees which tend to dull down as the months progress. Several sketches from a refreshed, long-due sun-lit London! 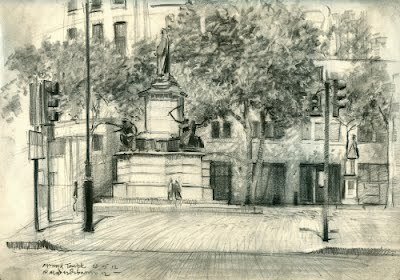 Just a couple of weeks now before I am back in London for a visit, so here is a drawing from a previous trip back to the capital, on a sub-zero day in December 2010. You may recall the huge blizzard we had that winter, when the snow stayed on the ground for nearly two weeks. 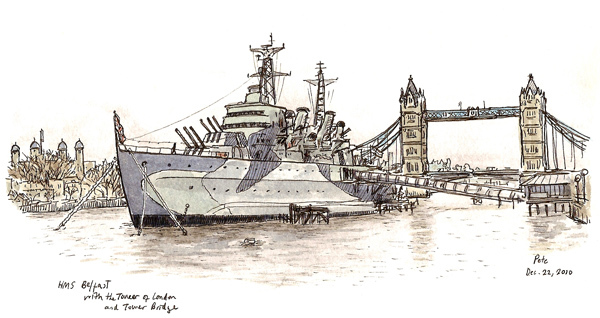 Despite intense cold I still got out to draw as much as possible, and one gloomy afternoon I sat by the Thames, with ice covering the Embankment and frosty Thames air biting my fingers, and sketched HMS Belfast with The Tower and Tower Bridge behind it. The 'Pool of London' this area is called, a natural harbour in the river and much busier in centuries past. To this day, I still cannot look at Tower Bridge and not think of the old Thames Television logo with that memorable little jingle, right before 'Rainbow' or something would come on. 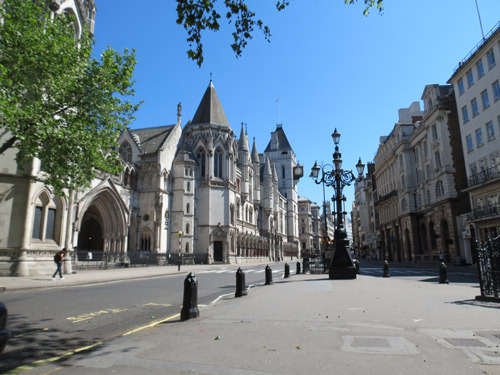 My brother once told me that the big guns on the side of HMS Belfast facing north are targeting Scratchwood Services, on the M1 out past Mill Hill, because obviously that's where the big threats are coming from. I don't know if it's true, but it's a nice story. Yesterday there was a brief sunny interval in the spring rains in London, and I took the opportunity to get out into Finsbury Park with my birthday present - a beautiful, handmade pochade box (thanks, Karin x). 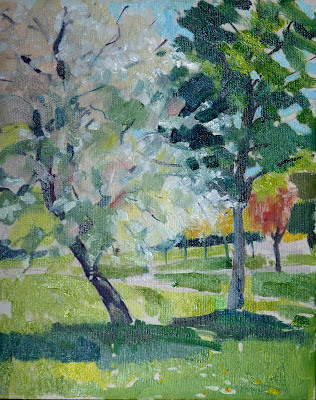 I notice this hawthorn tree every time I'm in the park. It leans at an angle, for some reason, and must have grown that way from the start. This time of year it's laden with blossom. Why does it incline towards the east, I wonder?